He has been punished for 'damaging the reputation' of the maligned minister. A doctor in central Vietnam has been fined VND5 million ($220) for calling on Minister of Health Nguyen Thi Kim Tien to resign on Facebook. 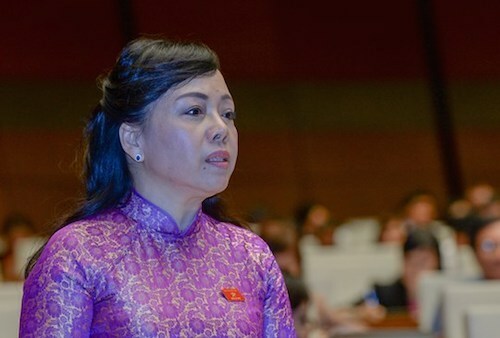 In his post, which appeared in July, Dr. Hoang Cong Truyen from Thua Thien-Hue Province said Tien was not capable enough to work as health minister and should step down, local media reported Thursday. The ministry subsequently asked provincial authorities to establish if Truyen was the author of the post, which it said was "insulting" and could "damage the minister's reputation." Truyen, who works at a district healthcare center, has been disciplined and fined, according to a decision signed by local authorities on August 15. But it was not until Thursday that the case was made public. The post has been removed; but it remains unclear when exactly. The health ministry has been making headlines recently over a number of scandals. In late August, the government ordered an investigation into its role in a case that resulted in the former bosses of a pharmaceutical company going to jail for forging paperwork to distribute fake cancer drugs. Tien's brother-in-law is an executive at the company but has not been implicated in the scam. Prime Minister Nguyen Xuan Phuc said government inspectors must take the issue “seriously” as it concerned public health, while Deputy PM Vu Duc Dam said the case had caused the public to lose trust in the health care sector. In April, Tien dismissed a parliamentary report that identified unsafe food as the main cause of cancer in Vietnam, saying cute and chronic infections are the main culprit. However, the public made it clear that they no longer trusted the food they ate every day. In May, eight patients died while undergoing kidney dialysis at a hospital in the northern province of Hoa Binh, leading to many people questioning the role of the health ministry. Similar questions have been raised following local media reports of newborn babies dying after receiving vaccinations. In a country that is among Facebook’s top 10 countries by users, the Vietnamese government has become increasingly wary of public sentiment on social media platforms. Tien, 58, has been health minister since August 2011. Back in 2015, she was one of the first cabinet members to launch an official Facebook page to interact with the public.